Breville’s premium countertop oven is the Smart Oven Air BOV900BSS. It is also the most expensive countertop oven that Breville makes. This review will walk you through whether it is worth the price. If you just want to see the Breville Smart Oven Air on Amazon with latest pricing and any discounts and warranty options, click here. You can use the table of contents below to skip to any portion of this review that is most interesting to you, or just read it all the way through. Why Is The Smart Oven Air A Premium Oven? What Are The Smart Air Oven Cooking Functions? What Are The Cooking Modes In Detail? How Much Does The Smart Oven Air Weigh? What About The Smart Oven Air Warranty? What Are The Breville Smart Oven Air Special Cooking Functions? So What About The Smart Oven Air Oven Rack Positions? What Comes With The Breville Smart Oven Air? Breville Smart Oven Air: Recommendations? The Smart Oven Air has a lot of features that are similar to Breville’s other, non-premium countertop ovens. Breville countertop ovens are known for having a lot of functions and features. The Smart Air Oven has these plus a few more like Air Fry and Dehydrate. Smart Air Oven also has a lot more interior oven space than the other Breville countertop ovens. The convection fan in the Smart Oven Air is a two-speed convection fan, one of the only countertop convection ovens to have two speeds. 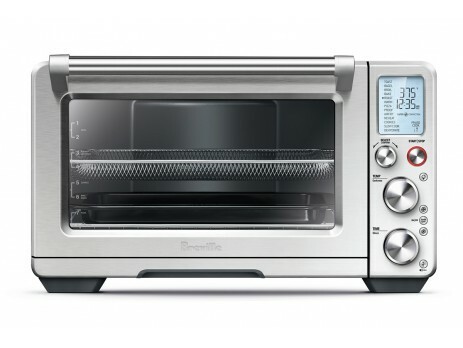 The lowest priced Breville countertop ovens don’t have convection fans. These are not convection ovens, while the Breville Smart Oven Pro (the model just below the Smart Oven Air in price) has a convection fan but not a two speed fan. The Smart Air Oven has thirteen preset cooking functions, that’s a lot. Each of these preset functions works with the oven’s Element IQ System and each of the six oven heating elements to automatically cook for best results. 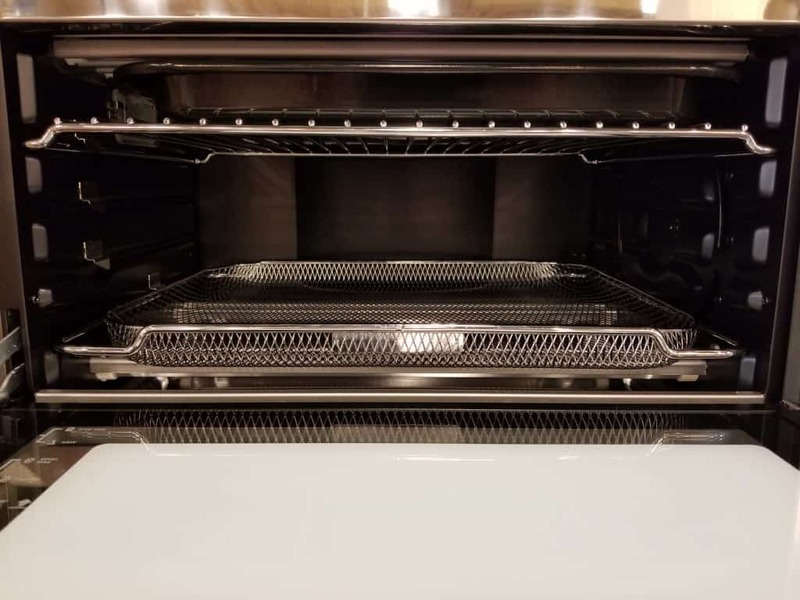 These heating elements are located on the top and bottom of the oven and each element is turned on or off at higher or lower power by the Element IQ System, based on the function that you choose. As we described above, the Smart Oven Air has a two speed convection cooking system. What this means is that the oven has a fan in the back of the oven that, when turned on, moves your oven air around the oven at either a “regular” or a high speed. Moving oven air around generally makes your cooking faster and generally cooks more evenly than without a fan. There is a general rule of thumb for converting cooking times and temperatures from non-convection cooking to convection cooking (regular speed). That rule is, when you’re using a non-convection recipe and cooking with regular speed convection to either: (1) reduce the cooking temperature in the recipe by 25 degrees Fahrenheit (about 15 degrees Celsius) or (2) reduce the cooking time in the non-convection recipe by 25%. Remember that the Smart Oven Air has high speed convection too, so that will reduce cooking time and temperatures even more when using the high speed mode. The Element IQ System as we described above uses the oven’s heating elements at higher or lower temperatures, and turns some on or off to best cook for the mode you choose. We detail these modes here so you know what kinds of things you can cook with your Smart Oven Air. The first group of functions are the “main” functions and the second group is made up of “specialty” functions. Roast mode is designed to cook thick cuts of meat or poultry. Ideally, roasting adds a crisp exterior to what your cooking while leaving the insides moist and tender. Temperatures in Roast mode can be set anywhere from 120 to 480 degrees Fahrenheit (50 to 250 degrees Celsius). Cooking times in Roast mode can be set up to 72 hours. You can change any time or temperature settings at any time during the cooking cycle if you need to. The default temperature in Roast mode is 400 degrees Fahrenheit and the default time is1 hour, with the Convection fan enabled by default. When you start the Roast mode, the oven starts heating to your chosen temperature and alerts you when that temperature is reached and the timer for any time that you’ve set will start. Bake mode is designed to use heat evenly in the top and bottom of your oven for cooking cakes, muffins and similar food as well as dense savory frozen dishes like lasagna or pot pies. Like Roast, use oven rack position 6 when using Bake mode, and use the rack position indicator on the oven window to tell where position 6 is located. Bake mode automatically starts at 325 degrees Fahrenheit by default and also defaults to 30 minutes cooking time with the Convection fan defaulted to “on”. You can manually set your temperature in Bake mode up to 480 degrees Fahrenheit (250 degrees Celsius) and up to 72 hours of cooking time. You can also turn off the convection fan if you don’t want to use it. Once you start the Bake mode, the oven will start heating until your preset temperature is reached. Once that happens, an alert will sound and the timer will countdown for the cooking time that you’ve chosen. Broiling is about searing the top side of your food at high temperature. Broil mode uses the heating elements at the top of the oven at their highest power to crisp open faced sandwiches, thinly sliced meat, fish, sausages and vegetables. Use Broil to crisp the top layer of mac n cheese or pizza or anything you want to crisp. Use rack positions 1 or 2 in Broil mode (see the positions noted on the oven window) and also use the broil wire rack and roasting pan (both are included) for better heat circulation. The Broil mode has three settings: HIGH, MED and LOW. Cooking times for each of these three setting can be chosen for up to 20 minutes. You can interrupt the cooking cycle any time you need to if you decide, for example, that you want to cook longer than you originally planned. Toast is what you might expect, basically cooking the top layer of bread while keeping the inside sot and moist. Use Toast mode to also heat and crisp English muffins and frozen waffles. Use oven position 4 in Toast mode (see the rack position indicator on the oven window). The oven is designed to fit up to 9 slices of conventionally sliced bread. Use the “Time” dial on the oven’s control panel to select the number of slices that you’re toasting. To choose the level of “darkness” for your toast, use the “Temperature” dial to select anywhere from 1 of 7 degrees of darkness. Toast mode by default chooses 4 slices of bread and darkness level 4. Bagel mode is designed to cook the inside of a bagel, crumpet or specialty thick bread and only lightly toast the outside. Use rack position 4 in Bagel mode (see the positions indicated on the oven window). The oven is designed to fit up to 10 bagel slices. Rotate the “Time” dial on the oven’s control panel to set the number of slices you want to cook. Choose the “darkness” level you want (from 1 to 7) by rotating the “Temperature” dial. Warm mode keeps you food warm after you cook it. You can choose anywhere from 120 to 480 degrees Fahrenheit (50 to 250 degrees Celsius) in Warm mode for up to 72 hours. Warm mode, like all of the other modes, can be interrupted at any time you might want to interrupt it. The default settings in Warm mode is 160 degrees Fahrenheit, 1 hour time, and the Convection fan set to “on”. Make pizza with pizza mode. The heating elements in Pizza mode are set to melt cheese and crisp toppings while also adding crispness to the crust. Use the 13 inch pizza pan that comes with your Breville for cooking pizza and put it inside your oven when it’s preheating. The pizza pan should be used in rack position 7 (see the oven window for rack position indicators). The default temperature in Pizza mode is 375 Fahrenheit and default time is 20 minutes. Pizza mode turns the convection fan and frozen food function on by default. You may manually choose to set your temperature anywhere from from 120 degrees Fahrenheit (50 degrees Celsius) and up to 480 degrees Fahrenheit (250 degrees Celsius). The cooking time can be set for up to 1 hour. Once you make your settings, the oven will start heating, alert you when your temperature is reached and start your cooking timer. Proof mode uses a controlled temperature to raise “yeasty” bread or other dough in your oven. You can choose a temperature in Proof mode anywhere from 80 to 100 degrees Fahrenheit (27 to 38 degrees Celsius). Up to 2 hours of time can be selected in Proof mode. The default temperature is 85 degrees Fahrenheit and the default time is 1 hour. Convection is “on” in Proof mode by default. Use Air Fry to crisp food that you would alternatively fry in a traditional oil-based fryer, but without oil, but instead uses high heat and super convection. Use the air/fry/dehydrate basket included with your Breville oven with the Air Fry mode. By default, Air Fry mode is set to 400 degrees Fahrenheit, time set to 18 minutes, and Super Convection fan and Frozen are also set to “on”. Alternatively, choose temperatures from 120 degrees to 480 degrees Fahrenheit (50 to 250 degrees Celsius) and up to 1 hour of cooking time. Start the Air Fry mode and the oven will begin to heat. Once the temperature that you’ve selected is reached, the oven will alert you so you can put your food in the oven. The cooking time will then begin to count down. Reheat mode is designed to reheat refrigerated or frozen food without drying it out or over cooking. The default temperature for Reheat is 325 degrees Fahrenheit. The default Reheat time is 15 minutes. The Convection fan will be turned “on” by default in Reheat mode. Reheat setting can be manually selected with a temperature of anywhere from 120 degrees and 480 degrees Fahrenheit (50 to 250 degrees Celsius) and up to 2 hours of time. Use oven rack position 6 in Cookies mode (see the position indicator on the oven window). Manually select temperatures from 120 to 480 degrees Fahrenheit (50 to 250 degrees Celsius) for up to one hour in Cookies mode. Once your set temperature is reached, an alert will sound telling you to put your cookies in the oven. The timer will then start to count down from whatever cooking time you’ve chosen. Temperature is set to 325 degrees Fahrenheit by default in Cookie mode and time to 11 minutes, the Convection setting “on” by default in Cookie mode. Slow Cook mode uses low cooking temperatures and long cooking times to cook meat “slowly”. Slow cooking is usually applied to ribs, brisket and many other foods too. Use rack position 8, the lowest rack position, in Slow Cook mode. Choose either “HIGH” or “LOW” temperature settings in Slow Cook mode, no other temperature settings are allowed and choose up to 72 hours of cooking time in Slow Cook mode. After you choose your settings in Slow Mode, the oven will start and alert you when the oven is at the right temperature. Then put your food in the oven and the timer will count down to whatever time you’ve chosen. The oven will automatically switch to Warm mode after the time counts down. Slow Cook default settings are “HIGH”, 4 hours cooking time and Convection “on”. Dehydrate uses the convection fan on Super Convection with very low oven heat to help evaporate water out of vegetables, fruits and even other foods with a lot of water. Dehydrating your food preserves it for a long time. Use the Air Fry/Dehydrate basket in Dehydrate mode and oven rack position 3 (use the oven rack indicator on the oven door). The default temperature in Dehydrate mode is 125 degrees Fahrenheit and the default time is 12 hours, and Super Convection is turned on by default. Manual settings for Dehydrate mode range between 86 degrees and 176 degrees Fahrenheit (30 and 80 degrees Celsius). Choose up to 72 hours of cooking or dehydrating time in Dehydrate mode. The Breville Smart Oven Air weighs 39 pounds. This is almost twice as heavy as the Breville Smart Oven Pro (the closest model to the Oven Air), which weighs only 22 pounds. Weight isn’t always a mark of quality, or lack of it, but a lot of heavier countertop ovens are higher quality since stainless steel and additional components, and even larger ovens simply weigh more than plastic or lower quality metal. The Smart Oven Air comes with a 2 year warranty from Breville. This warranty is a lot better than their 1 year warranty on Breville’s lower priced countertops, but is still too short in our opinion. So, we recommend that you buy an extended warranty with any purchase of the Breville Smart Oven Air. Most extended warranty options are fairly inexpensive and usually easy to enforce. See warranty options and pricing options on Amazon here. Phase Cook – Use this button on oven’s front control panel to combine 2 functions. So, for example, use this to Broil for 10 minutes and then Bake for 1 hour. Phase Cook is only available in only Broil, Bake, Roast, Warm and Pizza modes. Rotate Remind – Use this button (labeled “SELECT/CONFIRM”) to sound an alert when you’re cooking in different oven rack positions and need to switch positions. Rotate Remind only words in Roast, Bake, Warm, Pizza, Air Fry, Reheat, Pizza, Cookies and Dehydrate modes. Pizza, Air Fry, Toast, Bagel, Reheat and Cookies modes. Magnetic Auto-Eject Rack – Use this function in rack position 3 or 4 (see the rack position indicator on the oven window to make sure). When you open the oven door, any rack in those rack positions will automatically eject itself partially out of the oven for easy access. Other – There is also an oven light button that will turn the oven interior light on or off and a conversion button that will convert temperatures between Fahrenheit and Celsius. There are 8 rack positions in the Smart Oven Air and Breville has a clever design to make use of all 8 in a countertop oven. The oven interior actually only has 4 slots for racks, but the oven rack is designed to be used right side up or upside down. When you flip the rack one way or another, you get two rack positions for each oven rack slot. Breville has marked the exterior of the oven window with rack positions in white lettering to let you know where is position is in the oven. The inside of the Smart Oven Air oven, the “box” is about 1 cubic foot. By comparison, the useable space in the Wolf Gourmet is about 0.72 cubic feet, even though the Wolf Gourmet Countertop oven “box” is 1.1 cubic feet, slightly larger than the same measure for the Smart Oven Air. By another comparison, the Breville Smart Oven Pro’s useable oven space is only 0.45 cubic feet. After adjusting for oven racks and heating elements, the Smart Oven Air measures 0.78 cubic feet. The same measurement in the Smart Oven Pro, the “usable” oven space, is only 0.45 cubic feet. Breville includes a lot of accessories with the Smart Oven Air. The Breville Smart Oven Air has a lot of functions and is a lot bigger than the rest of the Breville countertop ovens. It is also the most expensive Breville countertop oven. That is because it is a premium oven. For a detailed look at another even more expensive premium countertop oven, see our review of the Wolf Gourmet Countertop Oven here. Many people have commented that they like the larger sized Smart Oven Air compared to older, smaller models and also appreciate all of the functions. The larger sized oven gave them more reason to skip using their conventional ovens on a hot summer day. Some other customers have reported defects after using the Smart Oven Air for only a short time. To protect yourself against defects, we recommend buying an extended warranty since the Breville Smart Oven Air warranty only lasts for 2 years. The Smart Oven Air is a solid oven with a lot of functions and is one of the larger countertop ovens on the market. It is also one of the more expensive countertop ovens. If you are going to use it regularly and take advantage of all of the different cooking functions, then the Smart Oven Air is well worth the price in our opinion. This is especially true if you’ve able to use the Smart Oven Air in place of your standard sized oven. The Breville Smart Oven Air countertop oven, with extended protection, latest pricing and shipping terms is available on Amazon here.